Hair loss equally distress men and women. 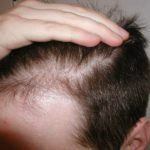 It is usual to lose some hairs but when the hair loss increases it becomes the cause of worry. Whether it is due to any reason like improper diet, parental inheritance, environmental conditions etc., hair loss can now be treated with an advanced technique like hair transplantation. While considering hair transplantation as the solution for hair loss, FUE hair transplant is the best procedure which can give best and assured hair transplant results. It is because this is the most advanced technique that uses best approaches for permanent and life long hair results and when a hair loss patient go for FUE hair transplant in Ahmedabad it becomes more trustworthy as there are experienced doctors and advanced technologies available at the clinic for performing FUE. In FUE the patient is firstly prepared for the procedure. Then the donor area is prepared and it is then shaved after which hair follicles are removed one after the other from the back and/or side of the head scalp using a round cutting instrument known as punches. The area is left with small dots to recover. After the preparation of grafts the recipient area is prepared. The surgeon then cleans and numbs the recipient area and then small holes are made with the help of scalpel or needle and then each graft is placed delicately into each hole with the help of planters. Later in few weeks or months hair will starts to grow. All processes are carried out under specialized team of experts with local anesthesia. The doctor at the clinic is FUE expert and has many years experience in the field. 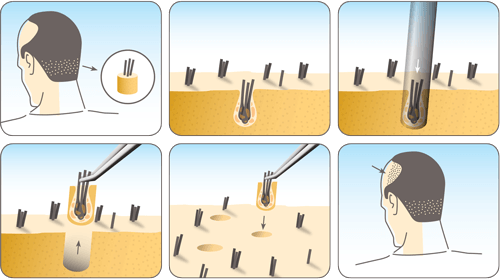 Micro removal technology is typically used for removal of hair follicles using tiny punches. So as to extract the follicles with either blunt punches or the sharp punches, only USFDA approved SAFE System is being used. 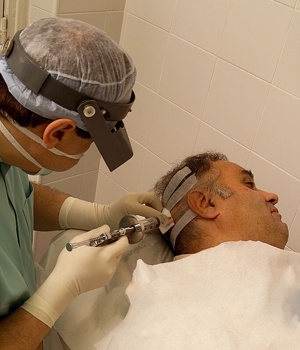 Maximum hair graft extraction can be assured in one session using advanced FUE. There is no necessity of scalpel and stitching as hair follicular unit is directly extracted one by one from the donor area. All procedure is performed with utmost care and with the safety of the user. All processes are completed for the procedure and patient is made comfortable at the clinic. Donor area is washed and shaved to start the procedure. Local anesthesia is applied to the donor area and grafts are extracted one after the other using punches. Recipient area is prepared with local anesthesia and grafts are then placed with planters in magnified vision. After the procedure is completed and patient is prepared to return home. 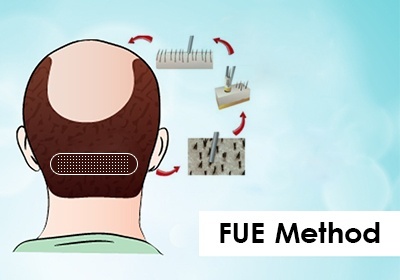 FUE ensures natural and permanent hair results. It is an advanced procedure when compared to other existing procedure. There is no need of incision and thus it does not leave behind any sort of scars or stitches. With FUE post surgical pain and discomfort is minimized. Time involved in healing process is comparatively less. Finer hair can be identified and selected for filling the desired hair line.